Welcome to the 318th Tablescape Thursday! 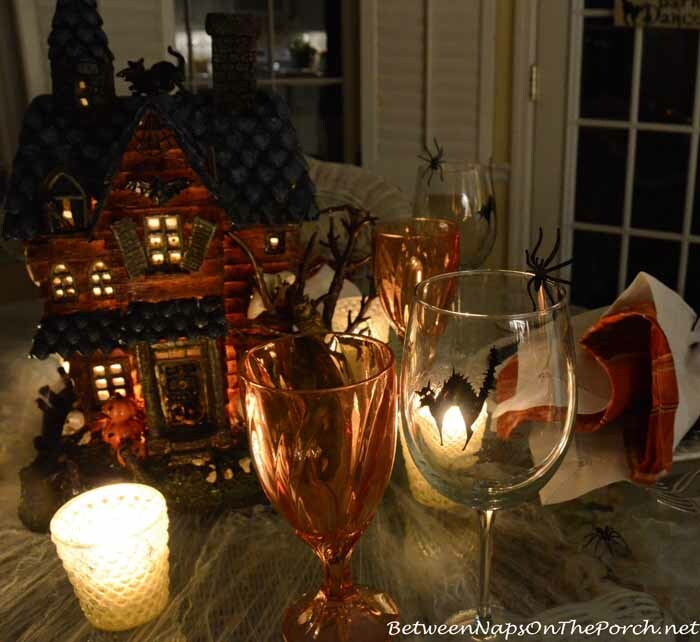 It was a dark and stormy night….well, actually it was more like a dark and rainy day but dark and stormy night sounds a lot more fun and creepy for our Halloween table setting. It was a tad too chilly to set a table out on the porch this week so we’re dining inside in the breakfast room for Tablescape Thursday. We aren’t dining alone, we have lots eight-legged friends for company. Buwahahahahahhaha. They’ve even spun a tablecloth for us! For the napkins I chose both white and plaid napkins, alternating which one was on the outside for a little interest. The Halloween plates are by Sakura and are called Haunted Hideaway. I think I found them in Home Goods but it could have been via eBay, hard to remember now. 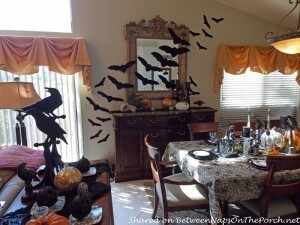 You can see them a bit better in this Halloween tablescape (shown below) from last year. After falling in love with Marie’s beaded-spider napkin rings in last week’s Halloween table setting, I ordered some on eBay. Hard to see but they have a black teardrop-shaped, faceted-jewel for the body and lots of beaded legs. The black scaredy cat glasses are from Overstock dot-com. You’ll get a better view of those in just a second. Let’s check out the centerpiece. There’s even a black kitty on the roof which ties back to our stemware for this table setting. A view of the back…I chose twig flatware for this week’s tablescape since it kind of mimics all the scary trees around our haunted house. Just as I decided to light up the house, the sun came out for a bit. lol Bad timing. That’s okay because I have few nighttime views to share, too. To make the spiderweb tablecloth, I stretched spider web stuff all across the table and taped it with clear tape underneath the table and under the plates where it isn’t visible. I also hooked it onto the wicker parts of the base of the table. 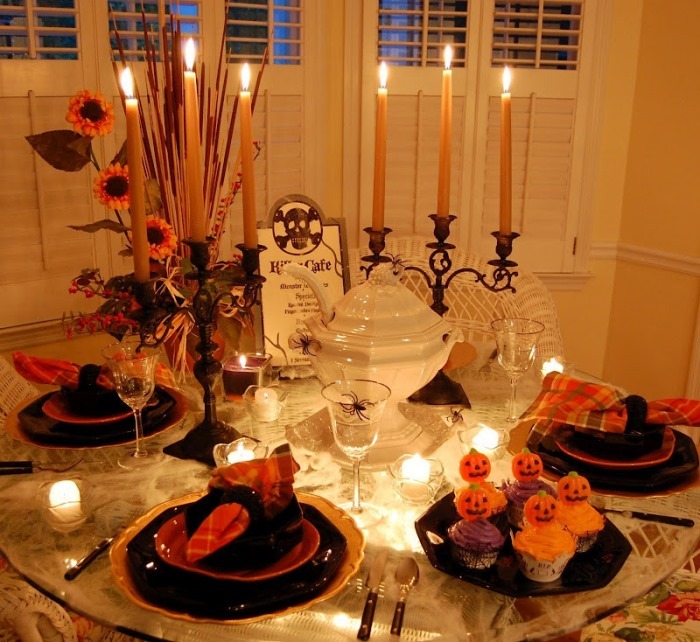 I made a similar cobweb tablecloth for this Halloween table setting back in 2009. I placed a string of lights underneath the table that year. Check out the cat’s eyes on the glasses, isn’t that a hoot! I hadn’t noticed how awesomely scary they could look until I lit the candles. Susan, I like this table a lot because it is both understated and effective. You show that it doesn’t take a lot to make a great table. Susan, this is such a fun table. Those napkin rings are fabulous. I may have to get some myself. 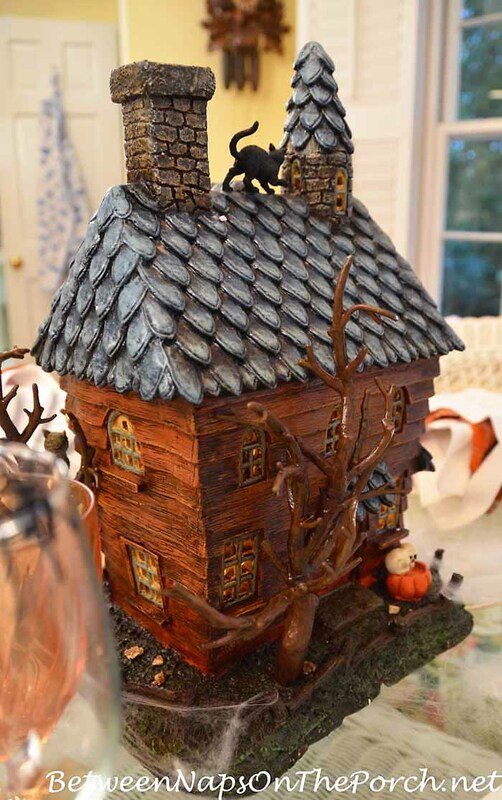 I love your haunted house centerpiece. I have a couple of metal ones, but the details on this are so much better. How fun to have some night shots with everything aglow. Have a wonderful week and thanks for always hosting TT!! Thanks for the party Susan! I made my own haunted house this year and have had so much fun with it! Costco has some great stuff, I have some metal pumpkins I bought years ago that still look great! 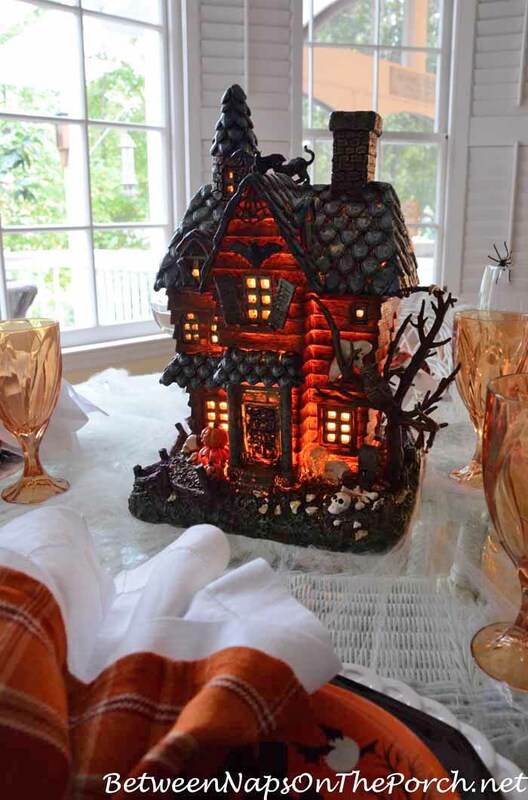 Love your table in candlelight, spooktacular! Oh my gosh, I need to see that Jenna! I bet it’s awesome! Me too, Jenna! 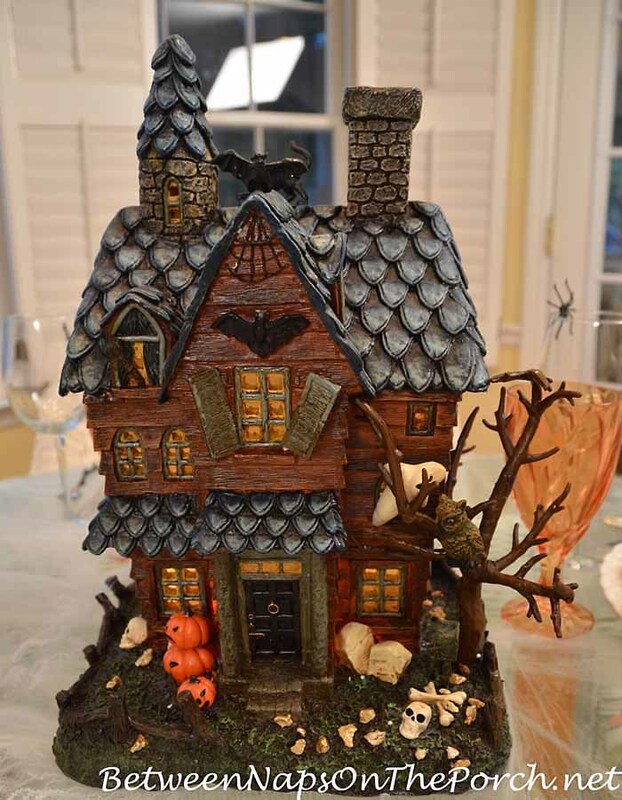 I’d love to see your home made haunted house! I’ve never even considered the possibility of making one. That sounds awesome. Please share some photos with Susan! Ahh … I figured it out. You are the Painted Apron lady. 🙂 Found your haunted house. I bet that was fun to make! That haunted house is so cute! That reminds me of a set I have that’s on the same line but mine didn’t light up. That spiders webbing looks so neat- but it drives me crazy to work with it! Love that scardy cat glass with the light behind it- perfect! 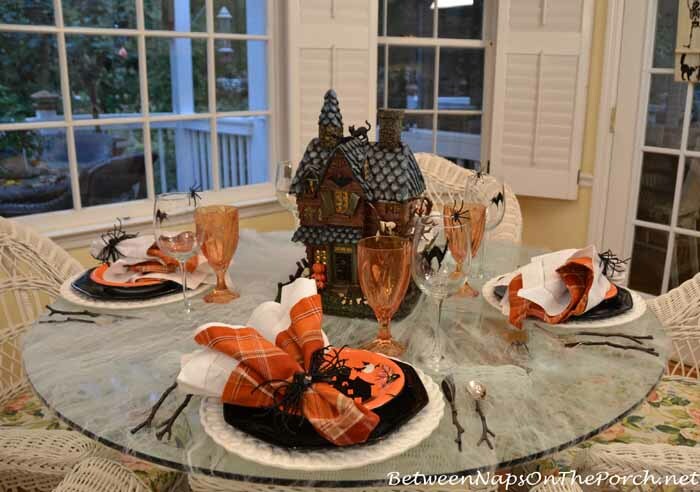 Our tablescapes have some similarites- I used a spider napkin ring too! lol Liz, it does me, too! I always dread handling it because it sticks to any rough spot on your hand…even spots you didn’t know you had…it find them! This time, for some reason, it was a little easier to work with. I didn’t try to stretch it as thin as I normally do and left it fluffier which I think I liked better for a “tablecloth.” I’d love some more spider napkin rings…will check those out. I love all of your tablescapes- so beautiful! Thanks for hosting! 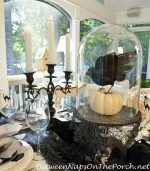 Fantastic Halloween table! 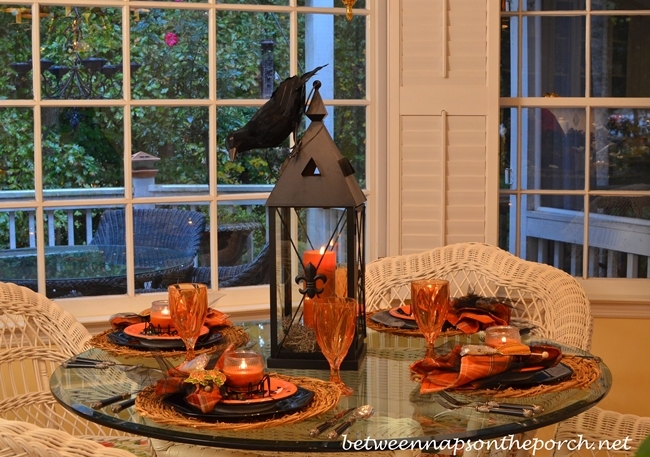 Great idea to use the spider’s web as a tablecloth! Thanks for hosting TT! Always fun! I love this! Just the right amount of spookiness without any gruesomeness. I love Halloween decor as long as it’s not gross and disgusting. You’ve done fun and it’s fabulous! I would so love to have the dishes and accessories to do a more extreme tablescape for each holiday, but if I bring home any more “stuff” my husband is not going to be happy! What fear arose through to my eyes and on to my ears. To see such a sight, filled me with fright! Run far far away, never to return to such a plight! Your table is set for to thrill those that will always fear the light! I love your haunted house. It is so detailed. Really spooky! I have a haunted house at my office with a ghost peeking out one window. My house will hold a tealight for the glow. I don’t decorate inside my house much for Halloween but my office looks like a mini-version of a Hobby Lobby display!!! lol! Love your table! 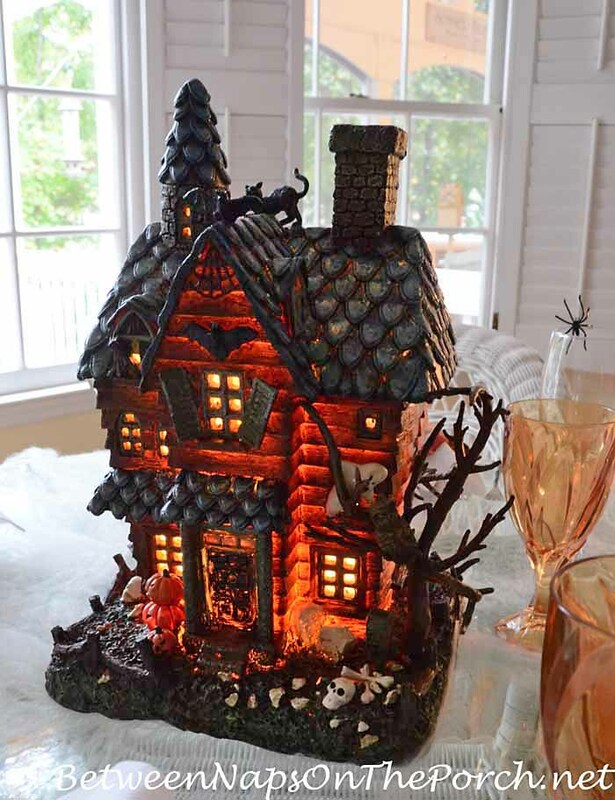 Your Haunted House is so adorable, I love it for your centerpiece. Those goblets, both sets are perfect! You’ve done it again! 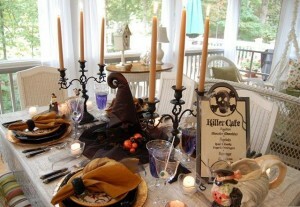 What a fun and cute table and I love the haunted house, simply adorable, as a centerpiece surrounded by candles! I’m posting an early Halloween tea party I had with my grandgirls who were visiting me up to today. Hope you like it. Thank you so much for the great party dear Susan. Thanks so much for the party, Susan!! I was quite for so long and missed so much blogging. You know that I love every TS you have. In this setting, the hunted house and the flatwares are to die for. Plaid gets me every time – love those fabulous napkins! You have created a fun table that anyone would enjoy for Halloween. The haunted house is adorable and you are correct, the details are wonderful. As always, thanks for hosting! The haunted house looks great all lit up. There is something about that little skull and the crossed bones behind him on the right side of the door that I find amusing. And there is even a pumpkin topiary! 😉 Very cute piece. I love the orange plaid napkins. They are perfect with the dinner and salad plates, as well as the orange glasses. The flat wear choice was perfect. I don’t know how you keep coming up with new ideas! Love your tablescape at night! How much fun is that?! I just love your website, everything you have done I love. You are an inspiration to all who love to decorate…looking forward to seeing what you do for Christmas…. I’m happy to see you showing Blogsites name along with title of images in blog party. I have my favorites I like to check out as well as new finding new sites. Hennie, I hadn’t even noticed folks doing that. 🙂 I don’t really have any control over that part…it just depends on what the blogger types in when they link up. I can see how that would be helpful, though. Very appropriately spooky setting! In the photos, the web stuff has a fog-like effect. Black cat, bat, and an owl, this house has everything–except a proper porch 😉 Love it all, so adorable. How do you “hit it out of the park” every single week! 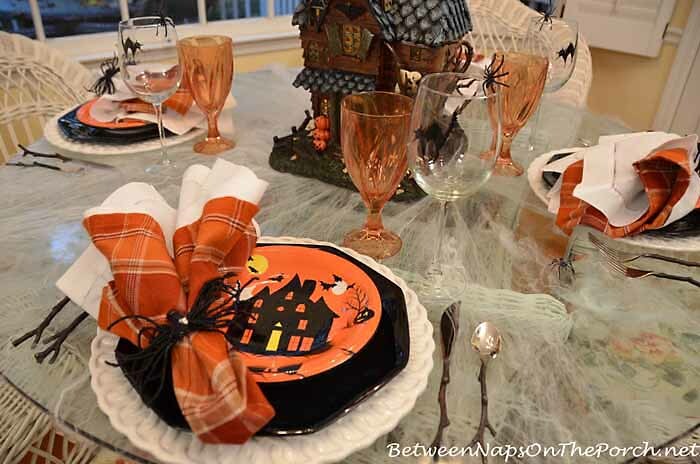 Great tablescape for Halloween…love those plates & the cat glasses. The Haunted House is eerily magnificent. Now that is just too cute, Susan! What a delightful way to dine! Beautiful! I love those plates. Everything about this is so well planned and meticulous…as always, you do a theme better than anyone! Love your napkin rings that you found on Ebay, and the orange plaid napkins. 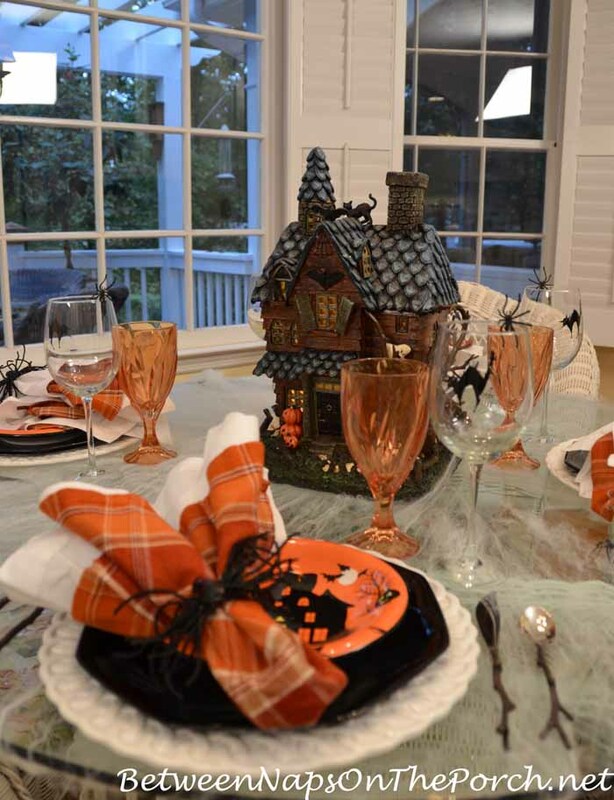 I wish I had plaid napkins and tablecloths in EVERY color ;o) The haunted house looks great all lit up and the cat wine glasses are great too! 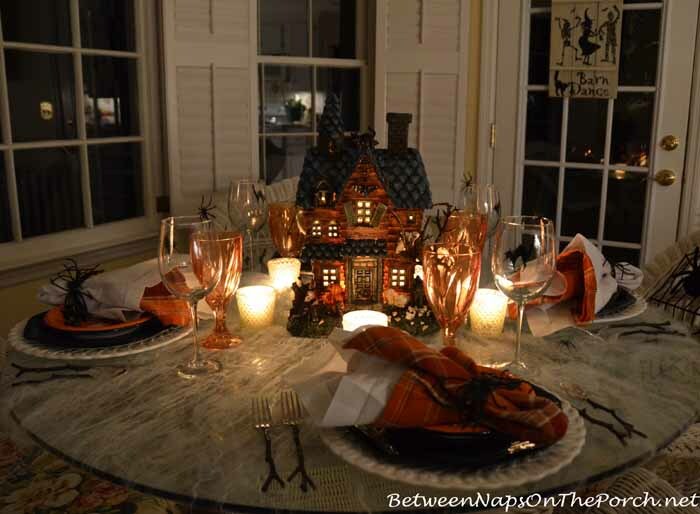 Love your Halloween table.. and you gave me such a good idea for using a ceramic chapel (lit from within by a bulb) as part of a Christmas tablescape! I have followed your blog and I love your work! I would be honored if you would join me next Tuesday, October 21 for my inaugural Tablescape Tuesday link party! Awesome haunted house!!! 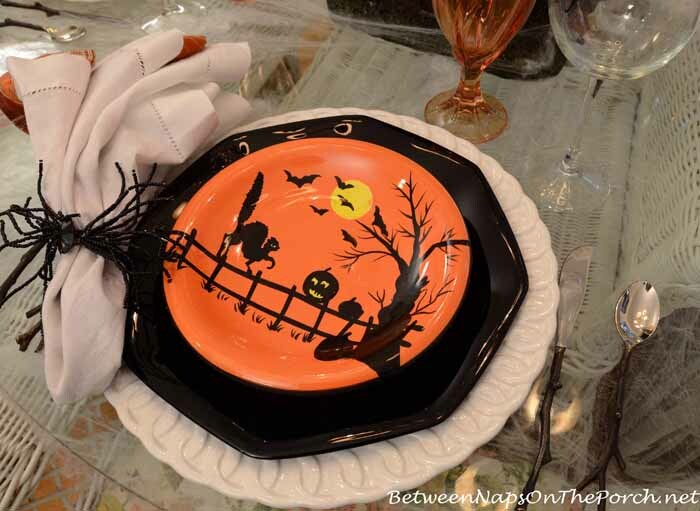 Love those dishes with the Halloween theme. Do you remember where you purchased them? The glasses matching the cat on the roof worked out perfectly…love it when that happens. Thanks,Susan. The plates are adorable. Will see if my bid gets them. That was so sweet of you to look them up…you’re a doll! I think I know the answer to this question….but thought I would give it a shot. 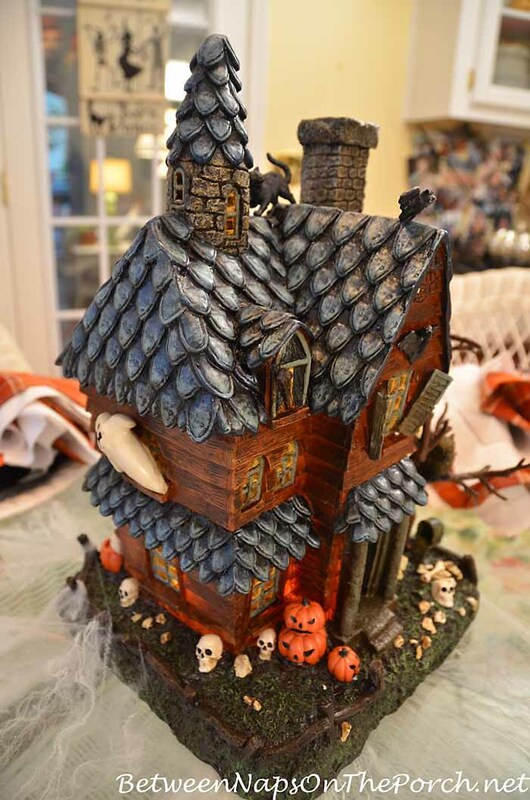 I have been looking for a haunted house like this for the past couple of years and cannot find one that I like as much. Any chance you would be interested in selling yours?? 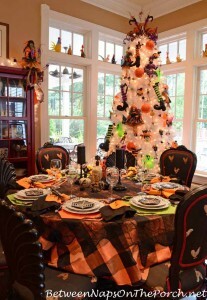 Love the table, I do a Witches Night Out for my friends every year at my house we eat dinner ,play games win prizes and just have a great time. Always enjoys seeing new ideas. Thanks for sharing yours. Terry Sluder ,Walhalla South Caroloina.